Home / Articles / Is It High Time To Contact Your Deceased Loved Ones? One of our clients, Angela came to our reading with the desire to reach out to her recently deceased mother. Her mother had gone into a coma after a stroke and Angela had sat with her in those final days making amends over some past hurts but her mom never regained consciousness. Asking to speak to or hear about deceased loved ones is a common theme in psychic readings. Often we don’t get to properly say goodbye or find the closure we need. Making that contact from “beyond” can often be helpful to both souls, creating peace and the ability for both to move on. It’s important to choose the right kind of psychic for making this type of connection. While it is possible for any psychic to contact your deceased loved ones, there are people who specialize in these sorts of readings. Usually they call themselves Mediums and will be clear about their services. With Angela, I was able to get some general information about her mom, but she wanted to see if she could speak to her directly. For this task, I referred her to a colleague of mine, Claudette, who is a Medium. Mediums develop their abilities like any other psychic, but Claudette has had a gift for speaking with the dead since early childhood. She is clairaudient and will typically hear the voice of the transitioned soul in her mind. She will locate the person her clients want to speak to, and if they are available, she will ask them to speak to her on behalf of the client. Other Mediums actually channel the dead, which can be a little unnerving if you’ve never experienced it. This means that the departed souls will actually speak through the Medium, and you as the client can interact with the soul through the body of the Medium (think of the movie Ghost, though not quite so dramatic). When Is It Appropriate to Contact A Loved One? No one is absolutely clear on how souls transition after death. 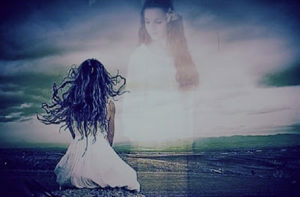 From my own experience and that of others who have been in contact with transitioned souls, it seems that most souls move along fairly quickly—usually within a few days. If there has been a sudden or shocking death, if the person was quite young, or if there are other unusual circumstances, it is possible for the soul to become confused and unclear about how/if to move on. If there is much unfinished business, such as a grudge, long-standing hurt, or lack of forgiveness, a soul may also feel reluctant to transition on toward their next stage. If these circumstances describe your situation, it may be appropriate to try contacting your deceased loved one. If you are merely curious or trying to contact someone who has been dead a long time, there is less certainty or reason that the transitioned soul would be hanging around and available for communication. Many spiritual traditions do speak about messages from “the ancestors,” but this is a different situation than trying to contact your great-great-grandmother. Of course, you can try to reach whoever you like, but I advise my clients that results may be spotty at best. Contacting the dead is not a guaranteed process. You may not be able to reach them; this is usually a good sign that the soul has moved on—and that is what is best for them. If there is one thing I’ve learned, it is that there is no “typical” contact with a deceased loved one. But you can make some general preparations. Be clear about why you want to make contact. Keep your own messages simple and to the point; this isn’t going to be the time for a rambling natter about the good old days! It probably won’t be like having a regular conversation either, even if the Medium is channeling the soul. Be open about what to expect. Although most people report (from near death experiences) that the other side is at the very least a neutral, loving space, whoever you are trying to contact may not be able to give you the closure or forgiveness you want. They may still be connected to their emotional body, where all the same hurts that existed in life are housed. But they may also be in a space of peace and unconditional love. There is no way to tell before contacting them. The most important thing you can do is send your wishes for love and peace. Let them know, if they appear confused, that they have in fact died and that it is okay for them to follow their angels or whatever guide appears (Jesus, other departed loved ones, pets, etc.) to their next stage. No soul will go without guidance into the light. The passing of a loved one is always a transition for us as well as them. We can help a soul to move forward by engaging in whatever version of prayer we believe in, sending our love and encouraging them to go on. Sometimes it is appropriate to reach out to a loved one who has passed on, but the most selfless thing we can do, however deep our grief, is to let them go.